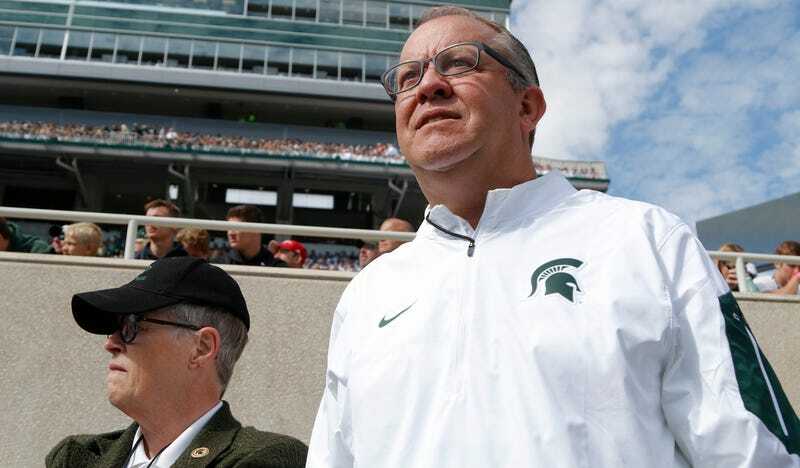 Michigan State athletic director Mark Hollis announced his resignation at a Friday morning press conference, shortly after it was first reported by The Detroit Free-Press. Hollis initially seemed to elude the first wave of scrutiny; former university president Lou Anna Simon stepped down on Wednesday following growing calls from the public, the Michigan State student population, and a number of the women who offered personal accounts of abuse suffered at the hands of Nassar. But given Nassar’s 20-year history in the Michigan State athletics department as team physician for the gymnastics and rowing teams, the ax was waiting for Hollis. Shortly after taking a beating in the public realm for its general uselessness on such matters, the NCAA announced on Tuesday an investigation into the Michigan State athletic department’s mishandling of complaints against Nassar. Hollis responded with a run-of-the-mill response statement; when Simon stepped down, he released another say-nothing statement before following her out the door Friday. The most recent chair of the NCAA’s Division I Men’s Basketball Committee, Hollis became athletic director in 2008 after 12 years of working in the Michigan State athletic department. A 1985 Michigan State graduate, Hollis landed his alma mater a number of successful coaches and renovation projects during his decade atop the program. He also scored a $150 million contract with Fox Sports, a network that coincidentally completely ignored the entire Larry Nassar scandal—minus some pasted AP coverage, Hollis’s resignation has received crickets from the outlet’s online branch. A reaction to the growing call for a house-clearing among the university’s leadership, Hollis’s resignation came at the end of a week that began with a Michigan State trustee boldly proclaiming that former Spartans and U.S. gymnastics team doctor Larry Nassar was “on an island” and that “our senior people were not complicit to what this pervert did.” A student-led rally calling for punitive action against the university’s senior leadership is scheduled for Friday. With the university’s two biggest names crossed off the list, the focus will likely turn to the board of trustees, which, aside from Mitch Lyons, has wholly supported the school’s current administration, citing donor support as the main reason for muting the voices of the victims, students, and alumni. Hollis’s last day on the job will be Jan. 31.